The Norwegian capital is moving away from the image of sleepy city by the sea to that of bustling metropolis in the midst of an architectural surge. Oslo may still be somewhat less popular as a tourist destination that some of its Nordic counterparts, namely Copenhagen and Stockholm, but it is now home to a growing café and bar culture, some fascinating museums, and easy access to nature. In short, a perfect destination for a big bowl of fresh air! And with Norwegian Airlines offering daily flights from Nice, experiencing the oldest of the three Scandinavian capitals has never been so easy! Oslo’s architectural landscape is an interesting mix of old monuments, like the Akershus fortress (pictured below) which dates back to the 14th-century, or the old district of Kvadraturen, which was destroyed in a fire in 1624 and rebuilt by the Danish-Norwegian king Christian IV, alongside cutting-edge buildings. The new opera and ballet house (pictured above) is probably the best example of this bolder Oslo. This marble and glass building, which looks like a glacier and features a plaza and roofscape, is just one the many projects undertaken to transform the port into a modern and avant-gardist area. On the opposite side of the harbour, the 19th-century shipyard of Aker Brygge has been turned into a very popular and trendy district, populated with top-notch restaurants, bars and residential areas. Overlooking the city, the Holmenkollen ski jump is another prime instance of aesthetism and world-class engineering. Described as ‘one of the first designer ski jumps’ by the Norwegian tourist board’s website, this Oslo icon has been upgraded no less than 19 times since it was built in 1892, and now looks like an imposing glass-and-steel cantilevered structure that projects a slash of light into the sky. With the great outdoors playing such an integral part of Norwegian life, a cruise in the Oslo fjord is a must. You will have great views of the cities and discover some idyllic bays and islands with their small wooden summer houses. 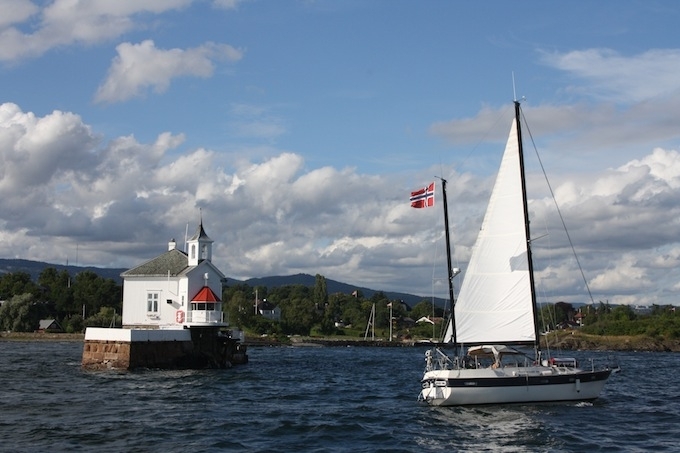 You will also pass by the peninsula of Bygdøy, which is home to six of the city’s best museums. Among the highlights on display you can find three very preserved Viking ships, the original exploration vessel Fran and Thor Heyerdahl’s Kon-Tiki raft, while the open-air Norsk Folkemuseum will teach you, through exhibits and activities, how people lived in Norway from 1500 to the present. Of course when you think of art in Norway, it is difficult to snub the country’s most famous painter, Edward Munch. An entire museum is dedicated to his most important works – about 1,120 paintings, including The Scream, 4,500 drawings, as well as notes, diaries and letters. Closer to the center, the National Gallery has a Munch room with 17 of his paintings of the highest quality on permanent display, among which another version of The Scream, The Sick Child, Ashes, Madonna and Melancholy. Another artist honoured by the city is Gustav Vigeland who created a unique park, Vigeland, made up of 200 sculptures in bronze, granite and wrought iron. Completed between 1939 and 1949, it has become one of Norway’s most popular tourist attractions and a great place to enjoy a picnic during the rare sunny days. Finally, when you are done with all the sightseeing and cultural excursions, and you’ve had your fill of nature, head to Karl Johans Gate, the hub of the city, for some serious retail therapy before tucking into some waffles in one of the many street cafes. Be careful though, Oslo may be a great destination for a weekend getaway and the plane tickets to get there may be cheap, but the city itself is ridiculously expensive. So to avoid putting a dent in your wallet, you should buy the Oslo Pass which allows you free access to all public transportation and museums. Make sure though that you book your flight to the capital’s main airport, Gardermoen, and not Torp airport at Sandefjord. The first one is pretty far north but is very well served by an airport express train called Flytoget that brings you to the city centre in about 20 to 25 minutes. With Torp, you only have the choice of a bus that takes about 75 minutes, or a taxi ride that may end up costing you twice as much as your original plane ticket. You have been warned!